I am happiest when I get to cook for my family and friends. Nothing makes me happier than thinking up a meal that they will love and enjoy and then preparing it for them! Moving to Ontario, I’ve had the opportunity to make some great new friends and for that I am very grateful. One of my girlfriends came over recently and I made this salad with her in mind. I was searching for a recipe with quinoa and stumbled upon a Cate’s World Kitchen recipe! I used her recipe as my inspiration but added my own touch with the vegetable mixture, changing the dressing and omitting and substituting several items. I served the salad with a piece of grilled mahi mahi on top and it was a delicious meal that disappeared quite quickly! Quinoa is a super food and I don’t cook with it nearly as much as I should! It is a delicious and filling item to add to your daily salad or as a side dish to your main meal! When you have flavours like this one in the mix, it is irresistable! So, cheers to good friends – new and old! Wash and prepare all of your ingredients. 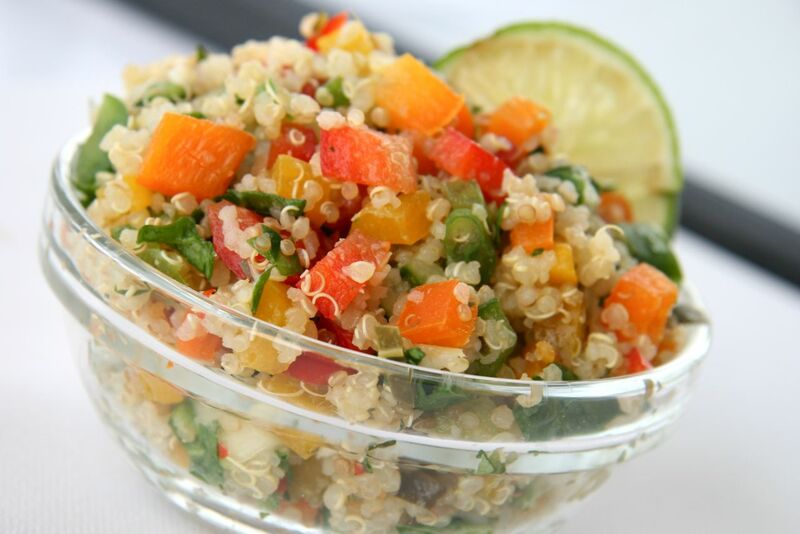 Place cilantro, basil, green onions, yellow pepper, red pepper, orange pepper, green pepper and cucumber in a large bowl. Set aside. In a large saucepan, add your quinoa. Over medium heat, toast the quinoa for a few minutes, until you hear it begin to crackle. Add 2 cups of water, lemongrass, kaffir leaves, red chiles, garlic and salt. Increase the heat to high and bring the quinoa mixture to a rapid boil. Once it’s reached a boil, cover and lower heat to a simmer. Allow mixture to cook for 12 – 15 minutes, or until all of the liquid is absorbed. When the quinoa is cooked, remove from the heat and let it sit for 5 minutes. Then, remove lid and fluff the quinoa with a fork. 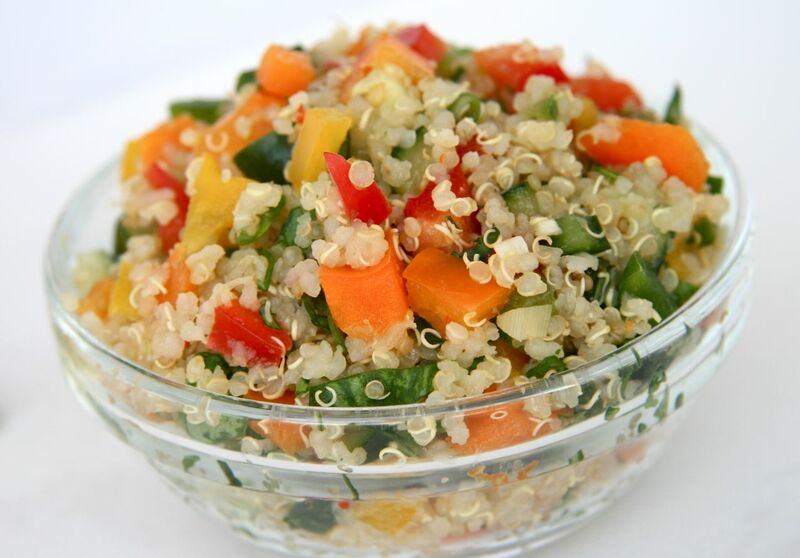 Once quinoa is cooled, add the quinoa to your vegetable and herb mixture. Stir well with a fork. Add the lime juice and coconut milk and stir well again. Serve immediately or place in fridge until ready! Adapted from Cate’s World Kitchen.